Candidates applying must not exceed the upper age limit of 40 years as reckoned on 01-01-2018. For OBC candidates, 3 years of upper relaxation is applicable whereas for SC/ST, 5 years. i) MBBS Graduate from the recognized University/Institution. ii) MD in the concerned discipline as per the department intend to join. Salary structure varies with the department posted. Eligible candidates who have successfully applied for Specialist Medical Officer Post will be assessed on the basis of merit obtained in the last qualifying degree followed by Interview of the short-listed candidates. Other reserved category candidates are exempted from paying application fee. 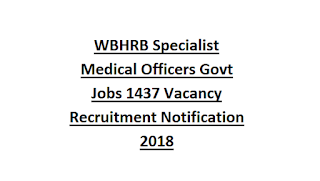 Qualified Medical Practitioners willing to join WBHRB as Specialist Medical Officers provided they fulfill the eligibility criterion can apply online through the official website https://eadmission.net.in/ before the last date i.e. 18th July 2018. 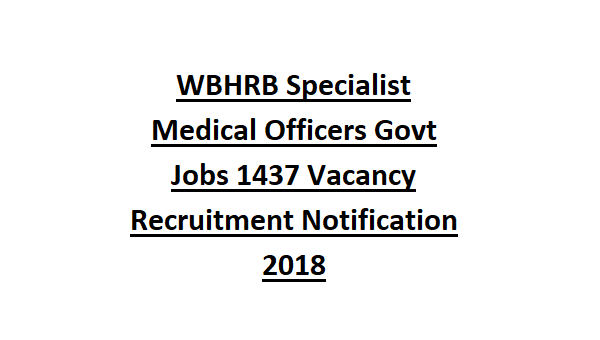 Candidates seeking Medical Officer Jobs under WBHRB Recruitment 2018 can refer the official notification above.